100’s and 1000’s of dollars. Note: at the time my Dad was a Physician’s Assistant, a PA, not a Doctor. That’s a distinction that my 8 year old self could not make. Wears white coat? Helps people? Works in hospital? = Doctor. I want to be a doctor because they help the sick and my dad is a doctor. Also, being a doctor you make 100’s and 1000’s of dollars a year. I will have a wife and three kids. And for transportation I am going to get a Porche. For fun I’ll go to Disneyland, Magic Mountain and fairs. I’m going to live in San Diego in a little green house. What will you be doing 20 years from now? This is Park School. I used to walk to school from the apartment we lived in which was literally two blocks away. I went there for grades Kindergarten through third grade. This is the school where partway through K, they bumped me to First grade. Being promoted like that was critical to my formation as an adult, though in retrospect it might have been easier on me to not have been. Does anyone really know at age 8 what they want to be when they grow up? It’s funny, but the internet already existed in 1978. Little did I know. And I wanted to drive a Porche? 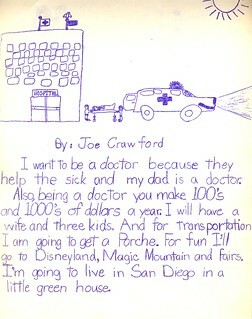 Joe Crawford blogged this at 8:43am in 2005 in August. The 4th was a Thursday. You are reading this 14 years later. Comment. There are no comments Tweet. Send email. It has hashtags→ drawings memories .